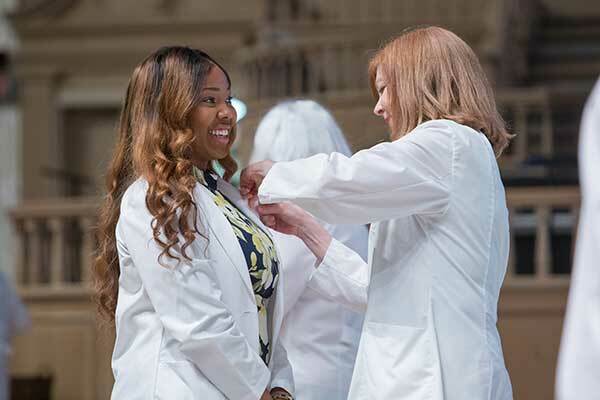 Samford University’s McWhorter School of Pharmacy honored its third-year Doctor of Pharmacy students at its annual professional pinning ceremony, April 20. The annual event recognized students as they make the transition from a predominately classroom environment to advanced pharmacy practice experience. It is a testament to how Samford ensures lasting success through steadfast adherence to its vision of preparing pharmacies who transform lives. Elaine Beech, a state representative in the Alabama State House of Representatives for district 65, provided the keynote address. Beech worked as a pharmacist with her late husband before beginning a career in public service. “You are about to embark on a portion of your life where you are going to make a difference in people’s lives every day,” she said. Beech challenged students to stay involved in the pharmacy profession, keeping up with the legislation that affects pharmacy. “It is the only way we can keep things going in our direction,” she said. Following her address, the school presented two of its highest awards. Third-year pharmacy student Mark Gilliam is this year’s recipient of the Cardinal Health Annual Independent Pharmacy Scholarship. Established in 2012 by Cardinal Health, the award provides a full-tuition scholarship for the final year of pharmacy school. Christopher Gersitz, the director of territory sales for Cardinal Health was present to make the announcement. Instructor Ronda Lacey was this year’s recipient of the Margaret Self Propst Teacher of the Year Award. This is the highest teaching honor given by McWhorter School of Pharmacy. “[Lacey’s] dedication to truly engage students one-on-one is always encouraging. She is supportive to students and is someone who wants to see those she teaches succeed in their endeavors,” said Michael Crouch, dean of McWhorter School of Pharmacy, reading students comments. The top performers on the Pharmacy Curriculum Outcomes Assessment were also recognized.